Saving One Dog at a Time . 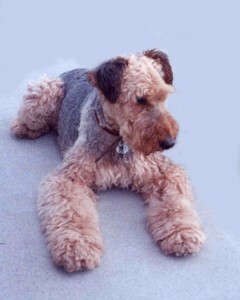 . .
Once upon a time, there was an elderly Airedale named Murphy the Wonder Dog. Without Rescue, Murphy would not have survived past 11 years of age. Thanks to Rescue, he lived until he was nearly 15! When Murphy was ten, his circumstances changed abruptly and not for the better. After years of living in comfort in a house, he found himself tethered in the yard while another dog occupied his home. Picture the loss of freedom, suddenly being tied out on a short rope in the brutal Yukon weather and pulling until your throat hurt. Think about an old, old dog shivering endlessly in the winter ice and searching vainly for shelter from the hot summer sun . . . . Imagine having only a bowl of food, a dish of water and the hard ground or a snow drift for a bed and comfort. Murphy stopped eating. Clearly, he hoped he might die and he nearly did until an AireCanada Airedale rescue worker undertook to save him . . . . So he came to Jim and I to join Angie Airedale and our toy Poodle. Murphy was one of the very best dogs we have ever had. He was gentle and quiet, loving and well-mannered, a character in his own right and, often, an inadvertently very funny boy. He ate for us and gained weight; we treated his ailments and he grew strong. His head came up and his tail stood straight as a ramrod. He was an Airedale again — one of the cherished ones, one of the lucky ones . . . .
And he was our boy for nearly three years . . . . We wouldn’t have traded those three years for anything . . . .
Airedale Rescue saves the old ones like Murphy the Wonder Dog (and middle aged ones and youngsters, too) and finds them new homes but not without cost. Please help us save more dogs like Murphy — one dog at a time! What a beautiful and poignant tribute to Murphy. Warms my heart to read your story. Will try to figure out how to donate. Bless you and your family for giving Murphy a loving forever home to live out his last days. Murphy and his rescuers are very fortunate to have found each other!